Only 7 steps to the sand! 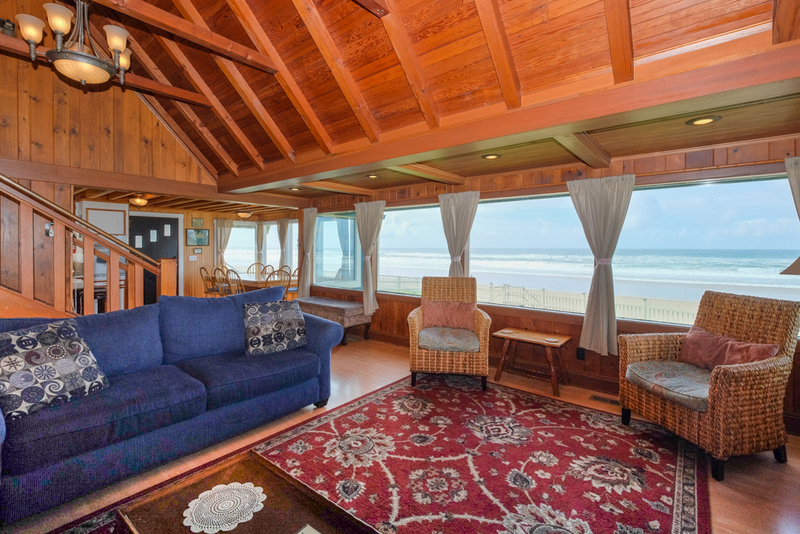 Beautifully Restored Ocean Front 1920s Historic House with big Sand and Surf views! Just a short walk to the casino via the beach! 5 bdrm / 2 bath. Enjoy the 15 foot Stone, Gas fireplace, beamed ceilings, hand crafted molding and wood work. 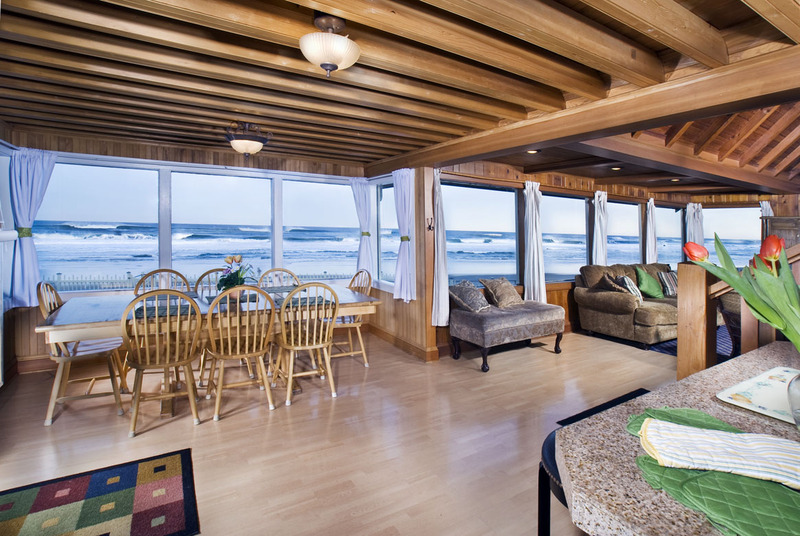 Grand room includes a family room with New Large Flat screen TV, dining area and Kitchen all with surf view. New king bedroom. Large, secluded patio opens to fenced yard, hot tub overlooking beach and WIFI. 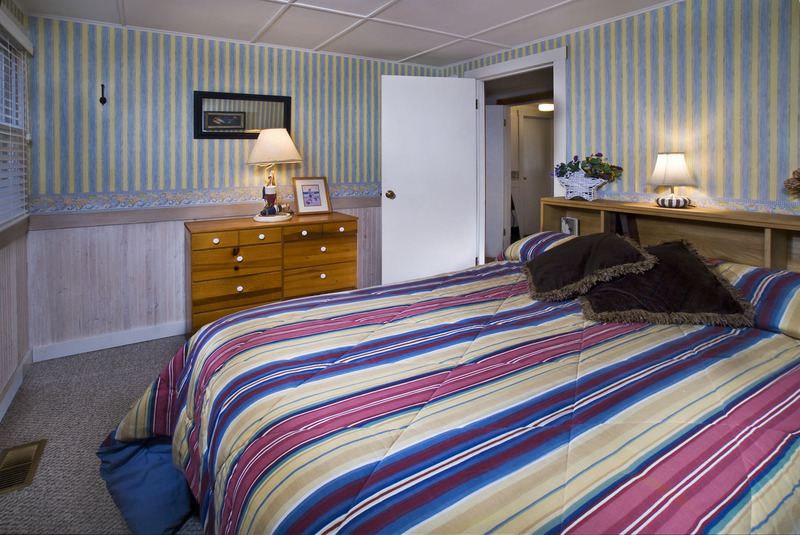 Completely furnished with linens and towels, as well as a starter kit of paper products. Summer 2019 July & Aug. have a 5 night minimum (unless filling in a gap). Please avoid a Single Night gap June- Sept. & Spring Break. Memorial Day & Labor Day Weekends 3 nt. Min. "Yearly a group of friends meet at the coast. Stairs to the Sea is the perfect getaway for our group. We always leave feeling glad we made this rental our choice and you can never beat the view!!" "This is our (4- grade school friends) 5th year to stay at the wonderful house. It is our girls week getaway every year!! We WILL continue our yearly tradition at Stairs to the Sea!!! Thank you Karen for letting us stay in this amazing home!!!" "Psst,Don't stay here. 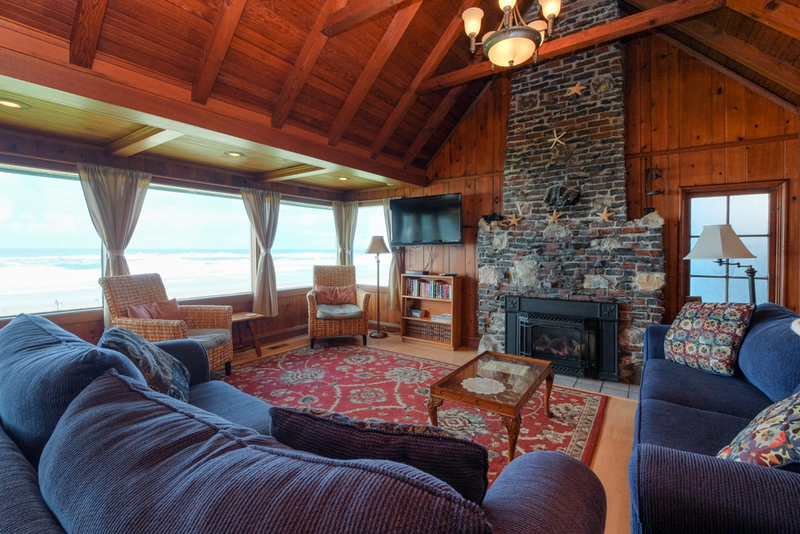 It's amazing, clean,lived in, loved (by us), seconds from the beach,walk to the casino, gorgeous view, cozy, fireplace and great for group." 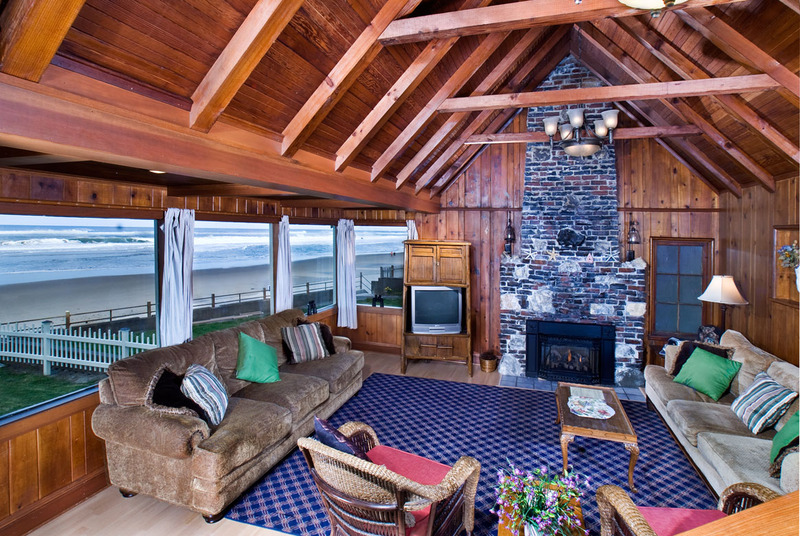 "Couldn’t be more pleased with our choice to stay in your beautiful rustic beach home. We were so pleased with how comfortable all the mattresses were to sleep on. " 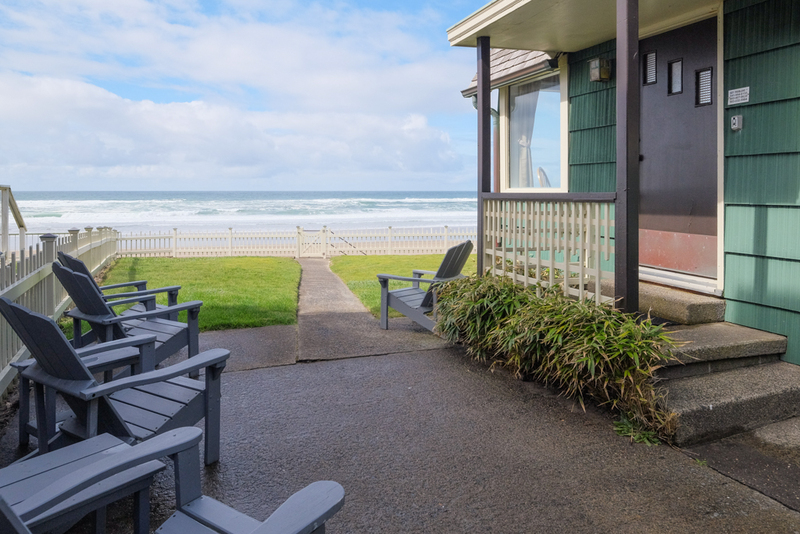 "We have been coming to Lincoln City as a little winter get away for over 30 years and believe me when I tell you this one of the coziest homes we've stayed in over the years! We LOVED it! 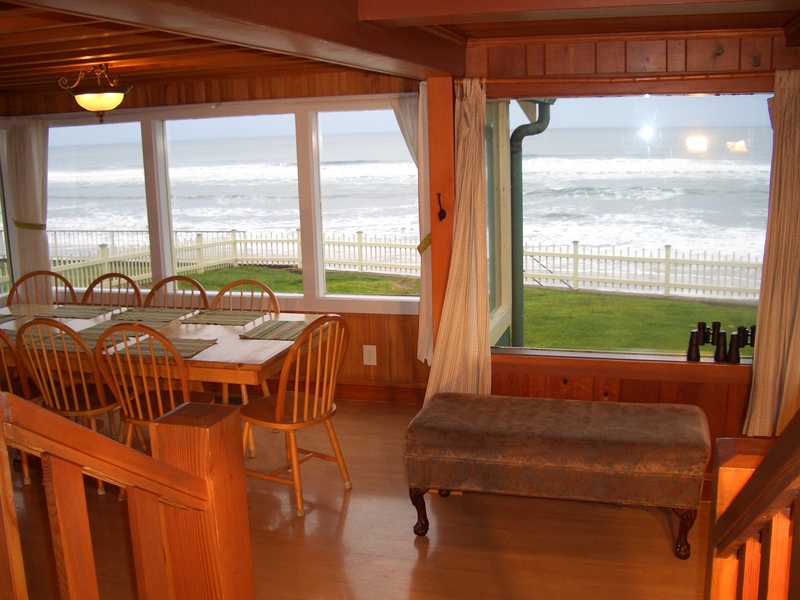 The view is incredible as the whole beach side of the house is windows from the kitchen to living room. The kitchen is very well stocked, the beds very comfortable and everything is clean and just plain cozy!! Thank you to the owners for sharing this wonderful home, we hope to stay again soon!" "Stayed many times in this home. It is the best! Weather was perfect, house was perfect. Good time had by our group of women who have been friends for about 15 years (all originally co workers). We will return again. Is the hot tub smaller???" We hope to go twice a year"
Manager Response: Thanks to all your ladies for staying at Stairs to the Sea ! "8 to 10 of us gals get together every year at Stairs to the Sea, and always find the house in tip top condition, already booked next year!" "When we arrived the house was very clean and inviting. The house is so comfortable from the beds to the living area. Works great with kids only 6 steps to the beach. Will be be back for more fun!!" Manager Response: So glad you enjoyed Stairs to the Sea! Please visit again soon! ""Stairs to the Sea" really means what it says! We love this home & location! This is our 3rd year staying here & our 10th+ year working with A-1 Beach Rentals. 5 bedrooms are very accommodating. Hot tub is wonderful too! Looking forward to 2019 :)"
"Great location & charming as can be! " Manager Response: Glad you had a pleasant stay. Visit again soon! "From two years old to ninty our family loved what this beautiful home and location had to offer. 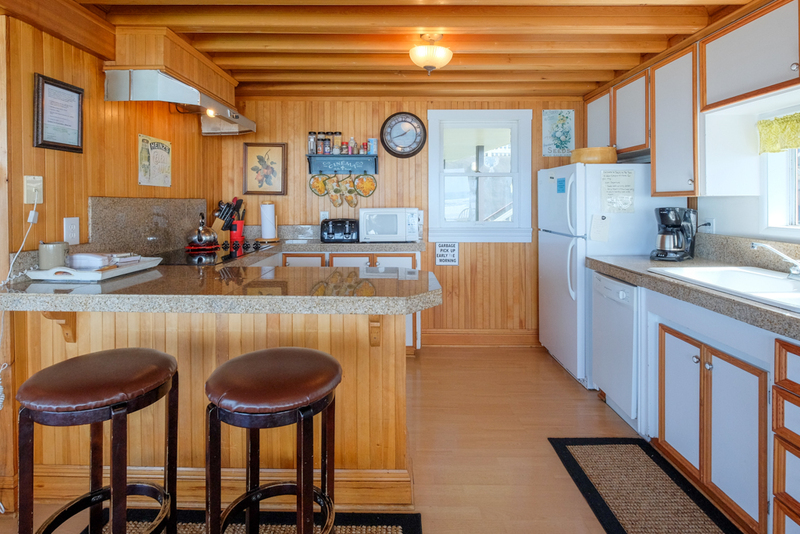 The house was very clean, decorated perfectly for the beach and had everything we needed in the kitchen as we love to cook. 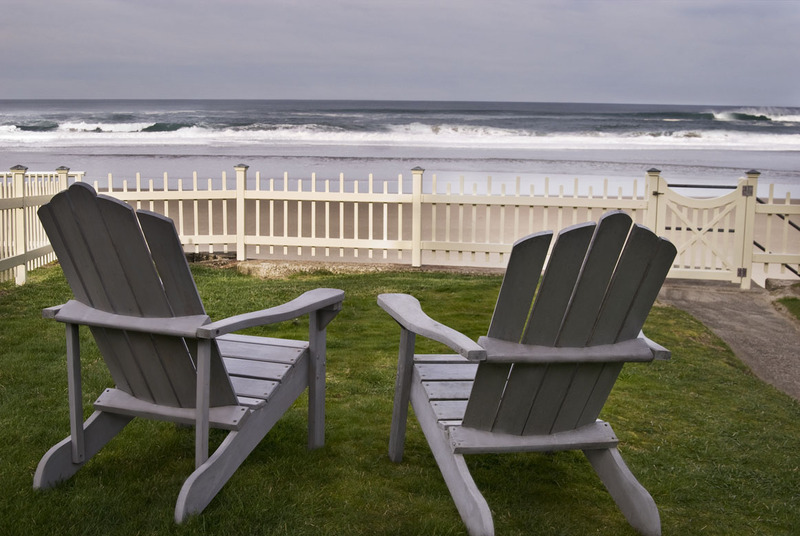 The yard had the perfect number of Adirondack chairs to watch the surf and sunset and was big enough to set up a croquet game. So nice to have just a few steps to the sand for long beach walks. This was our second time staying here and won't be our last. " Manager Response: So pleased that you had a great stay at Stairs to the Sea! Hope to see you again soon! "It’s as FANTABULOUS! All the comforts of home and an amazing view. " Manager Response: Happy that you had a great stay at Stairs to the Sea! Come visit again soon! "We love staying here - several times. I did want to just mention that the water hose by the kitchen door leaked the whole time. Also the laundry room door sticks very badly. Otherwise, everything else is great." Manager Response: Thanks for the heads up! See you next time! "Salem ladies love the Stairs To The Sea for the full view of the ocean we love. Great place to stay and close to Casino and stores. " Manager Response: Happy you enjoyed Stairs and Lincoln City! Visit again soon! 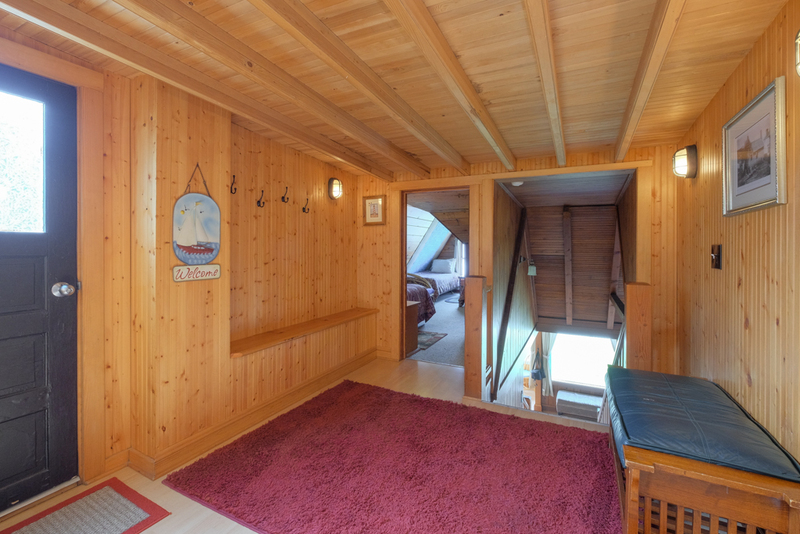 "We had a wonderful time & always enjoy staying at the Stairs to the Sea." Manager Response: Glad you enjoyed Stairs to the Sea! Visit again soon! 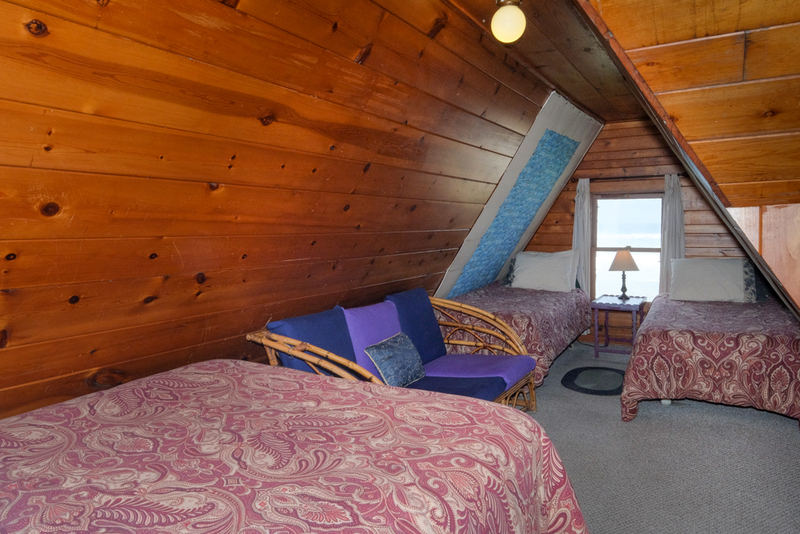 "We absolutely loved our stay at Stairs to the Sea. Great location, easy access, easy to find, clean, good service. " Manager Response: Really pleased that you enjoyed Stairs to the Sea! Hope to see you again soon! "Our family reunions here are always delightful. 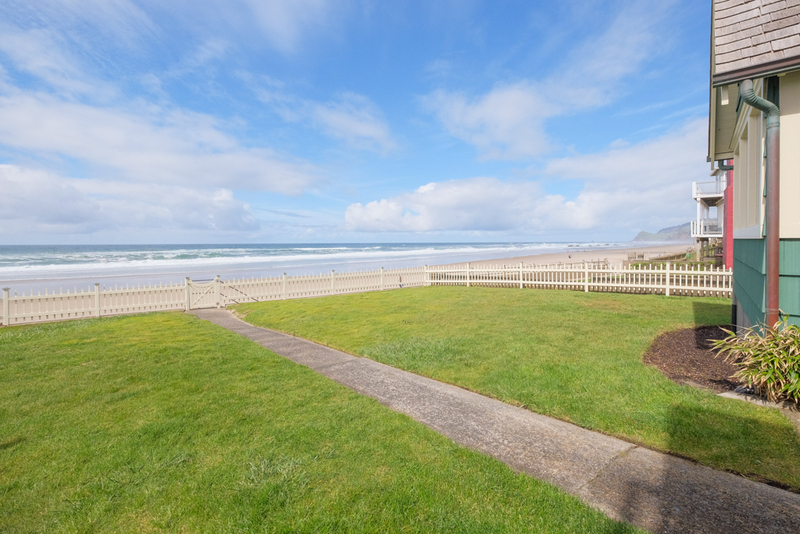 The access to the beach for long walks, and the fenced yard for our toddler are great. 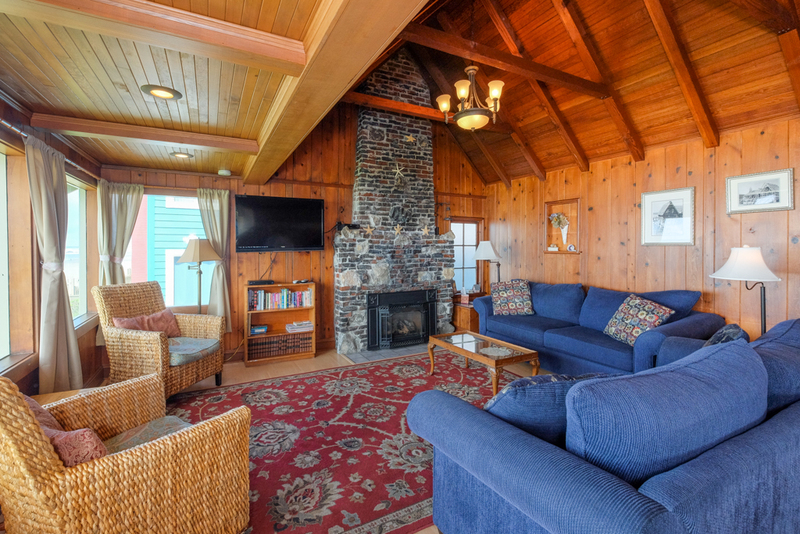 The layout gives space for our family to gather in the main living room with it's comfy couches and cozy fireplace. We look so forward to our time here. " Manager Response: Really happy that you had a great stay at Stairs to the Sea! Hope you visit again soon! "The place was great. Great location. We did find a pair of mens underwear in one of the spare bedrooms left from previous renters. There was also a shirt left in the coach. We did have a small leak in the ceiling above the dining room table." " We had a fantastic stay in this home. There is plenty of room and fantastic views of the ocean. I love being right on the beach so I can sit and watch my grandchildren play. This will be our home of choice for every spring break. " Manager Response: Very happy that you enjoyed your stay at Stairs to the Sea! Visit again soon! "Everything was fine , love the house and closeness to the beach." "We've stayed here 3 out of the last 4 years and it's about as perfect for our family gathering as you can get. The close proximity of the beach, and it's location to things to do along the coast, is what everyone in our group enjoys the most, but also the amount of space suits our party of 7 just right. A-1 Rental has been an absolute pleasure to work with and if we ever decide to stay in a different rental we'll be sure to check with them first!" Manager Response: So glad that you enjoyed Stairs to the Sea! Please visit again soon! "It was a perfect get away for all of us: 3 sisters, 2 husbands, and 5 kids (ages 4-15) Some swam in the ocean and/or soaked in the hot tub. Some played in the sand and flew kites. We played hide-and-go-seek and Go Fish! We had an amazing fire on the beach! Then we all got great nights sleep in comfortable, clean beds. The house had everything we needed! Thank you for sharing your house with us!" "The split level house offers plenty of sleeping options and there are amazing views from the lower floor. 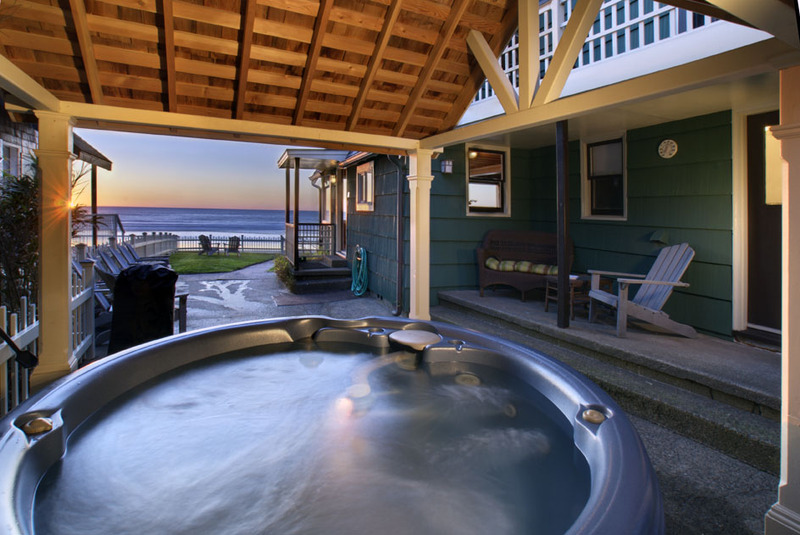 Who doesn't want to sit in a hot tub while looking at the ocean! Though, the hot tub's jets weren't powerful, the temperature and view were incredible. Beds were amazingly comfortable! " Manager Response: So glad that you enjoyed Stairs to the Sea! Please come again! "Very nice time. Great view." Manager Response: Glad you enjoyed your stay! Please come again soon! "We loved this house. It is great for our group of 9 ladies, gathering at the beach to celebrate long time friendship. A few minor issues but owners were super quick in addressing and rectifying them." Manager Response: So glad we were able to address those issues in a timely manner! Hope to see you again soon! 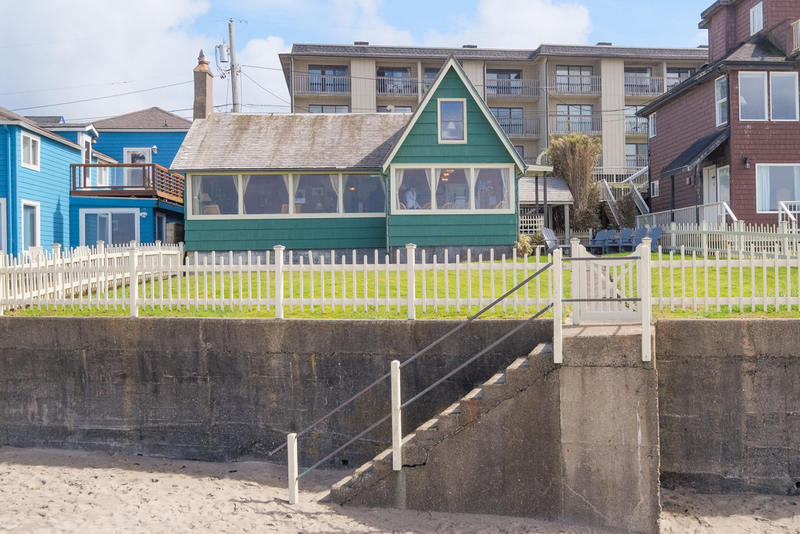 "A gem of a historic house with fabulous oceanfront views in a quiet neighborhood just blocks off Hwy 101. Enough can't be said about the therapeutic effect of watching the surf in all kinds of weather. Simply awe inspiring. The only complaint, and this is so minor it's hardly worth mentioning, is the extremely small and darkly lit downstairs bathroom shower. 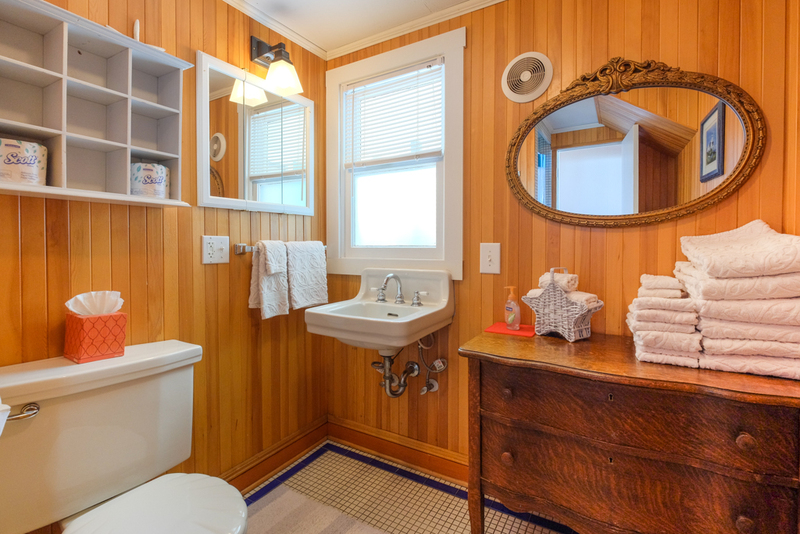 It's common with historic houses to have small shower stalls and this one is really difficult to function in. That being said, I would not hesitate to stay here and just use the upstairs shower instead. No worries! Great rental at a greater price." "Great home beautiful view super roomy "
Manager Response: So glad that you enjoyed Stairs to the Sea! Come again soon! "The view, the view, the view! all day long we gazed at the surf. It was epically peaceful and steps to the beach. " 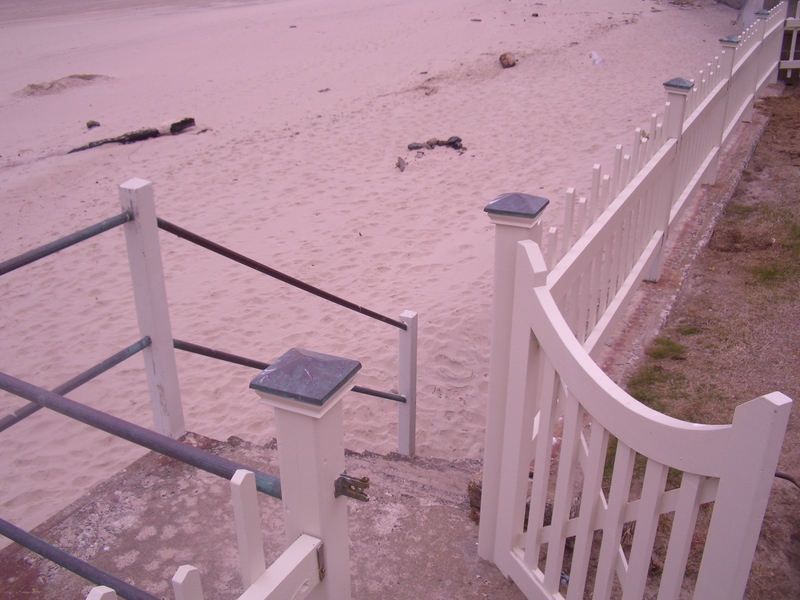 Manager Response: Glad you enjoyed the beach and Stairs to the Sea! Hope to see you again soon! "This is the second time we have stayed here. We had all the kids and grandkids with us and everyone had a great time! 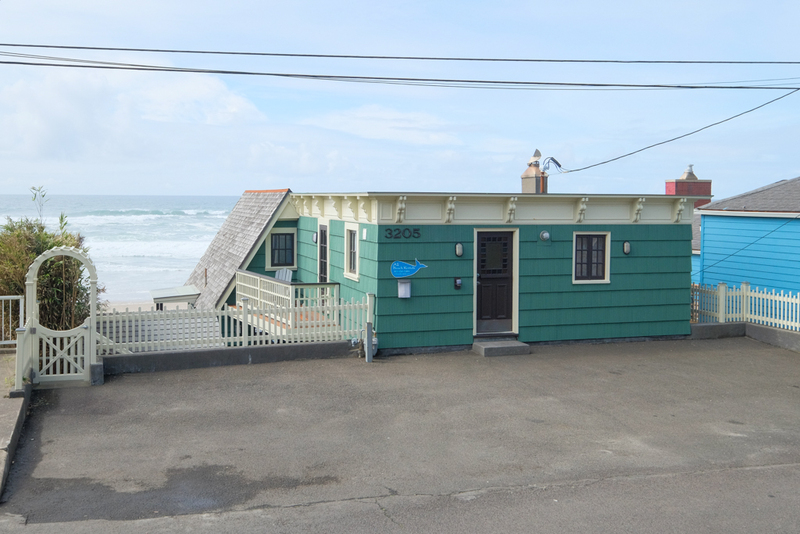 The house is quirky but a perfect fit if your looking for old Oregon beach house charm. 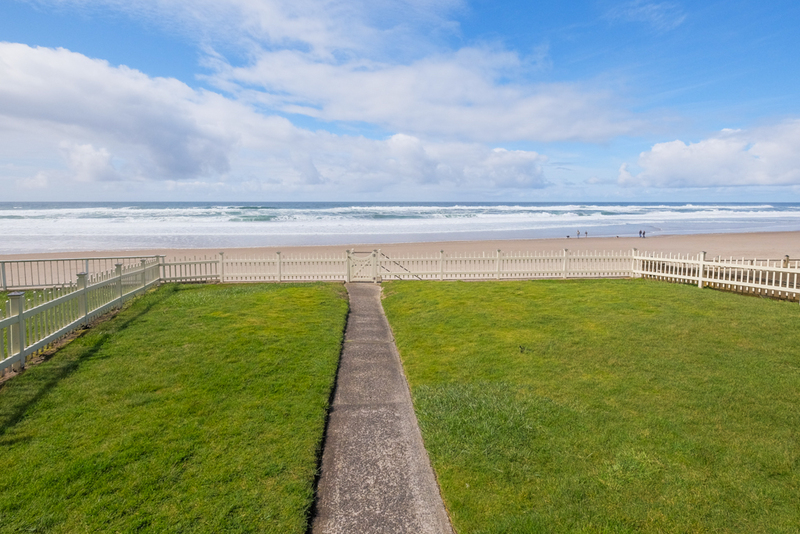 Couldn't be closer to the beach and centraly located in Lincoln City! We'll be back!!! Manager Response: Thanks for staying at Stairs! Come again soon! "We LOVE-LOVE the "Stairs to the Sea" home. 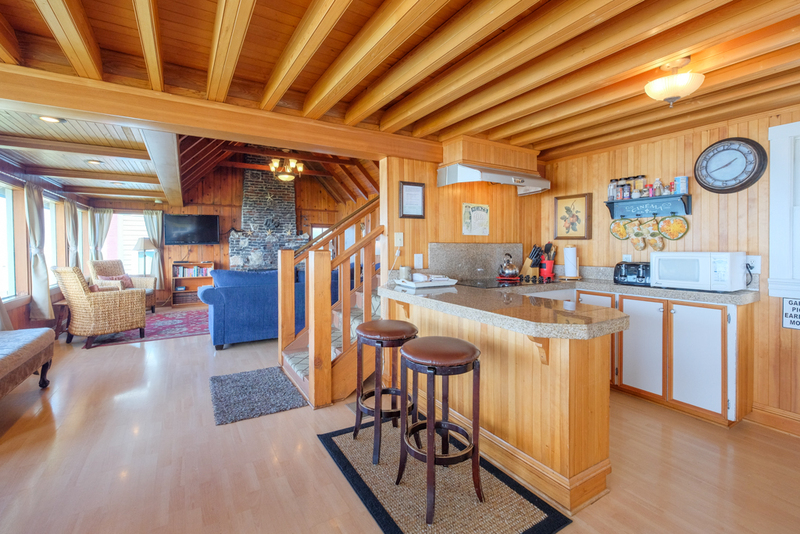 The beach view & hot tub is the best + to top it off 5 bedrooms with plenty of room. Our annual Girl's get-away is planned again 2017 & looking forward to a repeat!!!" Manager Response: So glad you enjoyed your stay! Looking forward to seeing you again soon! "We have come back yet again to stay at our favorite beach house. It's the perfect getaway family trip. Love having the house right on the beach and so close to shopping. This house never disappoints." Manager Response: Really glad you came to stay with us! Please visit again soon! "Our second vacation at the Stairs was wonderful. Like the view of the ocean from North to South. Good customer service. Be back in 2018.
very happy with the stay"
Manager Response: So glad you enjoyed your stay! See you again in 2018! "It was just as good as it has always been." Manager Response: So glad you enjoyed your time at the beach! Please come again! Manager Response: Thanks for visiting! "This is our favorite beach house for our family to gather, relax and have fun! Especially great is the easy access to the beach. " Manager Response: Thanks so much! See you again! "We were 8 women, all related, and ready for fun. We loved the stairs right to the beach...what a great house. I have stayed there many times and it is my favorite beach house. The weather was not great...but we just stayed in, played games and caught up on family stuff. Thanks, we had a good time." Manager Response: Glad that you enjoyed your stay! Please come again soon! 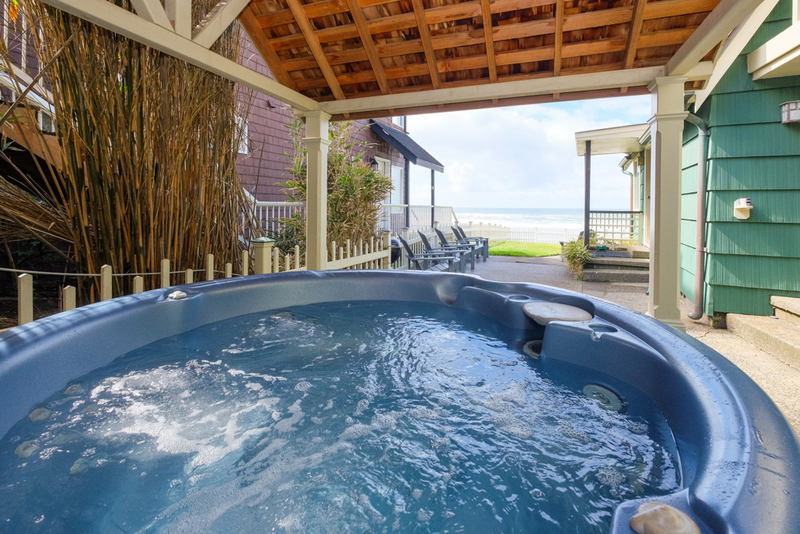 "The picture of the hot tub only lacks people sitting in it with the great view of the surf. The beach is down a dozen steps from the fenced yard. Watching the sun go down while sitting in the house, the yard, or the hot tub is tough to beat. On a fairly quiet street it is very peaceful except for people having great fun on the beach. Drawbacks of the house include a small dishwasher, small showers, and no windows with screens to open when the afternoon sun starts coming in all those glorious windows that face to ocean. These things pale when you consider the LOCATION !!!" Manager Response: Glad you enjoyed Stairs to the Sea! Come again soon! "6 women, laughing, talking, eating,palying games and loving each other as long term friends do. Our 15th year at the beach. (At least 7 of them in this great house by the beach. This place holds our secrets, our loss and our stories of long gone loves. We will come, again and again"
Manager Response: So glad that you love Stairs to the Sea! See You again soon! 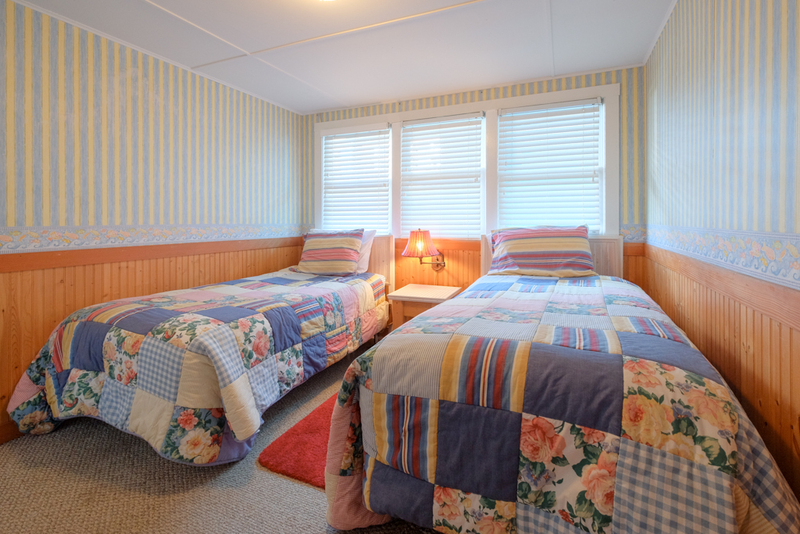 The beds were all very comfortable, with the exception of the twin beds upstairs and one of the twins downstairs. My king bed in one of the upstairs bedrooms was heavenly. The living room was cozy and comfy. The kitchen was adequate. Floor to ceiling windows ran the full length of the living room and dining room. The million dollar view was absolutely amazing! hat was very concerning. After some persistence on our part, the gas company was called. A very significant gas leak was detected and the fireplace was shut completely down. " "Great 7 days of family fun - indoors and outdoors. We ate, puzzled, and watched March Madness when too rainy to play outside. House was well equipped, clean, and comfortable! Gas fireplace and hot tub are wonderful assets to this place! Loved it all!" Manager Response: So glad you enjoyed your time at the beach! Please visit again soon! "Our knitting group was over the moon with the place. We will be back and will spread the word about the house. The view was beyond our expectations." "Wonderful time with family. This house has room enough for a big family get together and the grandchildren had a blast both playing in the large yard and on the beach. Thank you"
Manager Response: Glad you had a great time! Please come again soon! "A perfect house to spend time with your family, don't have to worry about driving to the beach you are there. Love your home that you share with all!" Manager Response: Glad that you had a great time at Stairs! Please come again soon! "enjoyed as usual as we have stayed here in Sept. for at least 12 years if not more." Manager Response: So glad you returned to Stairs to the Sea! Looking forward to seeing you again soon! "We brought our grown children and their families to stay at this awesome beach house. We had more than plenty of room for all 8 of us. Amazing view of ocean from dining and living areas and from the yard! Could see whales and sea lions from the house. Only 12 steps to the beach which made it convenient to spend the day on the beach. Safeway is nearby for convenient shopping. It was hard for us to leave and plan on returning in 2019." Manager Response: Glad you enjoyed your time at Stairs to the Sea! Please visit again soon! "This is the 3rd time we have rented this house for a girls weekend and it is just great for the 10 of us. We love this house!" Manager Response: Glad you enjoyed your stay! Please visit again soon! "The view is amazing and the house has a wonderful cabin like feel to it. 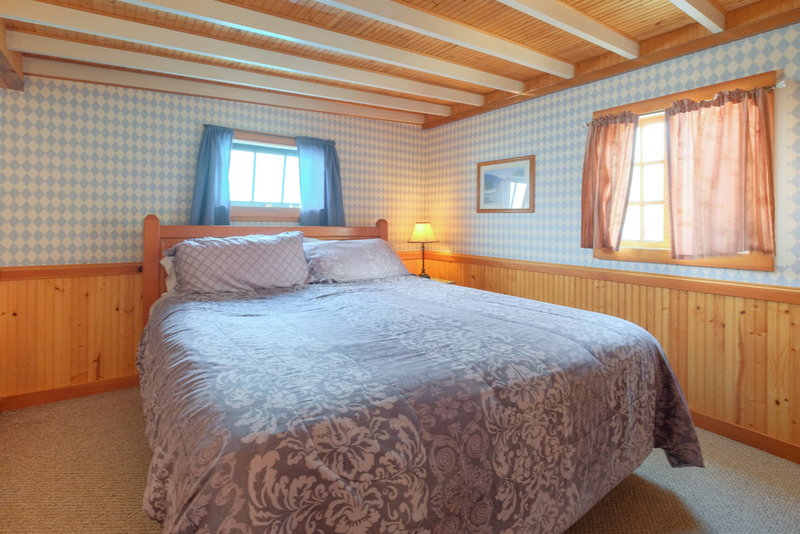 The bedroom options were wonderful and we are all planning a trip with our spouses and children. We will be back for sure. " Manager Response: So glad you enjoyed your stay at the beach! Please come again soon! Manager Response: Glad you enjoyed your stay! Come again soon! "It exceeded our expectations. The house felt larger than we anticipated and the location was ideal. Great viewing windows also. Will be back for sure." Manager Response: Thanks for staying with us! Please come again soon! "Great décor, large front room. Kitchen a little small. 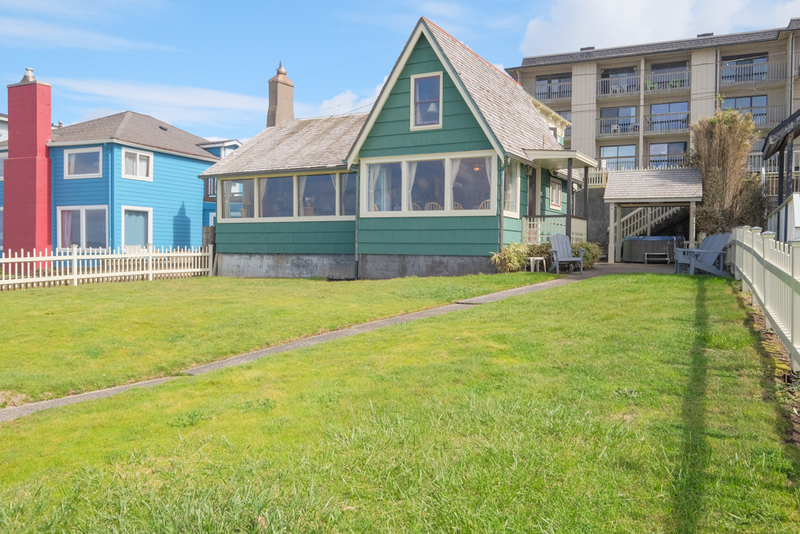 Nice beach front, Large front windows, great for whale watching." Manager Response: Glad you enjoyed Stairs to the Sea and the whales! Please visit again soon! "Precious house with a charming history, yet full updated and comfortable. 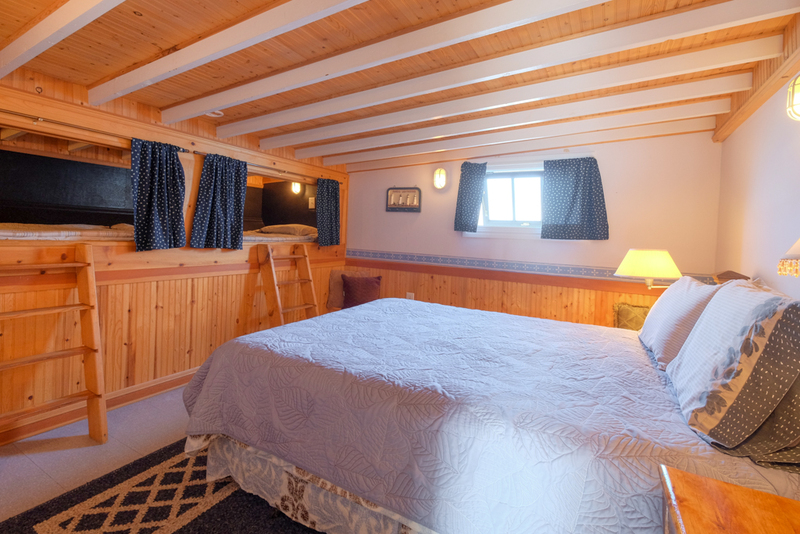 Owners were accessible and friendly and helpful, hot tub worked great, kids loved the little bunks in one of the bedrooms. House was clean and beds were comfy! Grass lawn was fenced and large enough for the kids to play a little without worrying about them rolling down the hill! Amazing view from the large windows in the living and dining area." Manager Response: Really happy that you enjoyed your time at the beach! Please visit again soon! "The rental was beautiful. Smaller than it looked from the pictures but perfect for us. Right on the beach and close to town! The fireplace worked perfect as well as the hot tub. Loved the beautiful view of the ocean while doing yoga in the living area!" Manager Response: So pleased that you enjoyed your time at the beach! Please visit again soon! 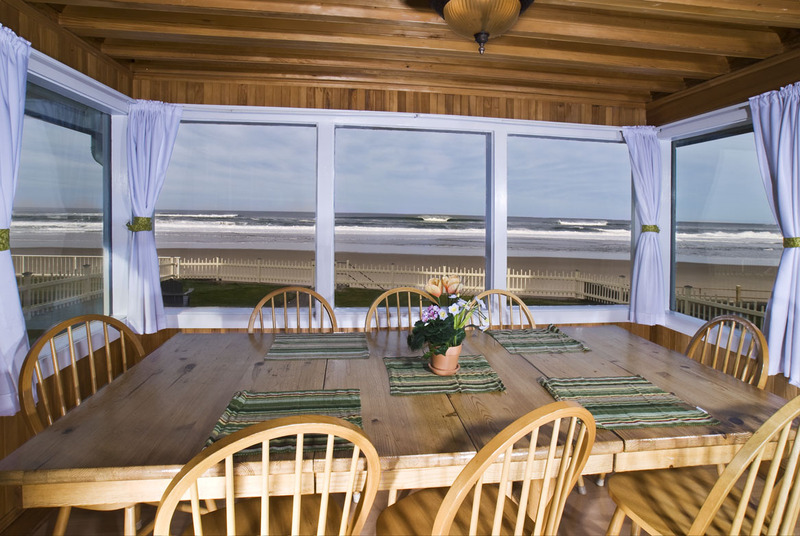 "Loved the panoramic views from the living and dining rooms, beach access was easy for the kids. There was plenty of room to spread out for each family. Showers were a bit tight but still doable. We were very happy with the accommodations and plan to do it again next year." Manager Response: So glad you enjoyed your stay at Stairs to the Sea! Please come again soon! 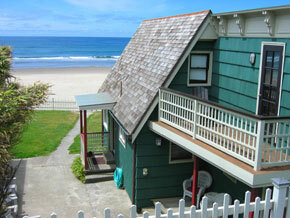 "Four of my sister's and my niece (from CA, WA and OR) recently spent a week at this charming beachfront retreat. This is our second stay and we thoroughly enjoyed ourselves again. Waking up each morning to the stunning view of the ocean was awesome. The weather was overcast most days but we enjoyed the fireplace and cozy furniture to snuggle in to read or nap. 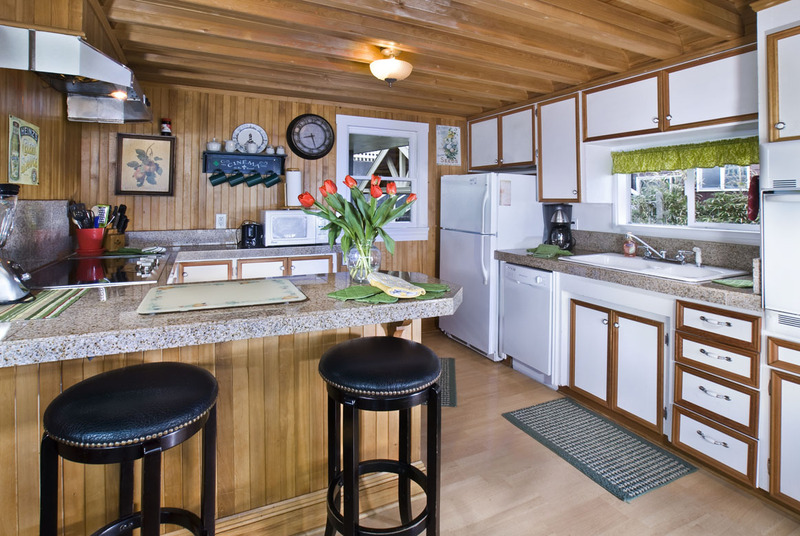 We prepared many of our meals in and found the galley kitchen had everything we needed. The large farmhouse table hosted many family meals and evenings of board games. This home itself is unique and we appreciate all vintage touches. I know there are many stories this house could share, and we have taken away many sweet memories once again. Thank you. Manager Response: So glad you enjoyed Stairs to the Sea! Please visit the beach again soon! 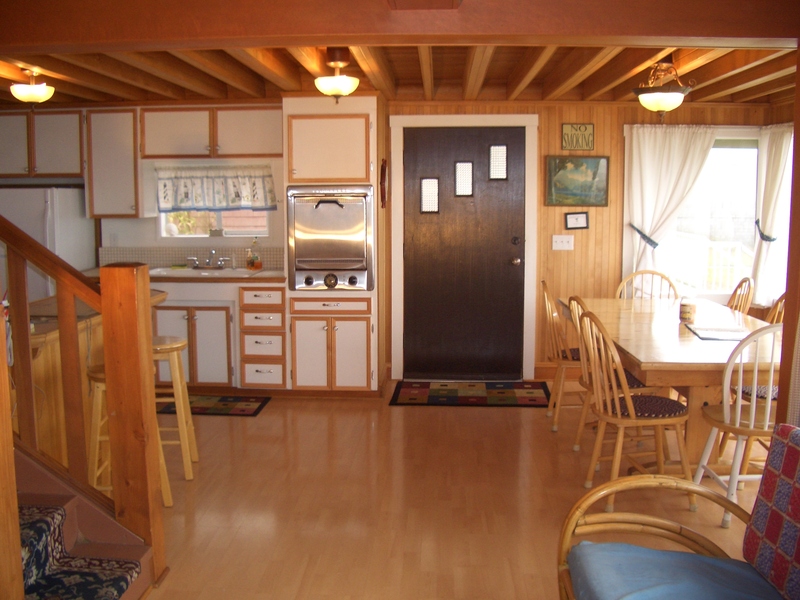 "The house was perfect, had great views, comfortable beds and easy access to the beach." Manager Response: Glad you enjoyed your time at Stairs to the Sea! Please come again soon! 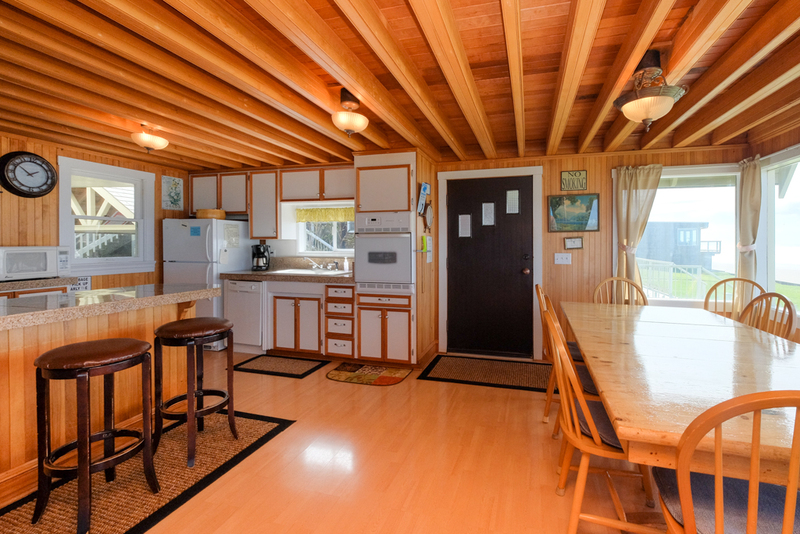 "This vacation rental was roomy and homey with all the comforts of home. The hot tub was nice for relaxing and the view was amazing. Close to everything and easy to find. I would definitely recommend this rental to others." Manager Response: Thanks for visiting the beach! Please come again! "What a lovely house to spend a girls weekend away at! Views were glorious and amenities we're practically perfect! " Manager Response: Thanks for your kind review of Stairs! Please come visit again soon! "After three years, we finally hit upon 5 straight days of sunshine and a chance to escape the heat wave in the city. We had 4 adults and two teens and had plenty of room for everyone. 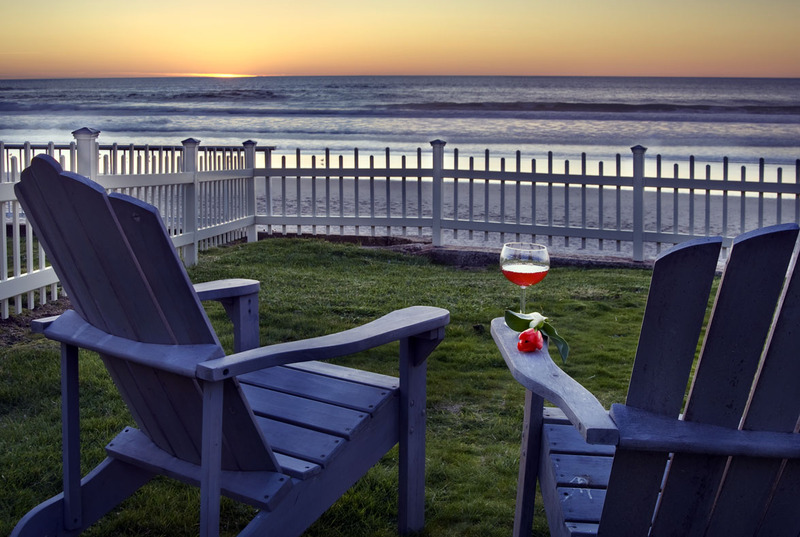 The side patio and spa have ocean views and serve as a wind block on those windy days." Manager Response: Really glad you enjoyed the coastal weather at Stairs! Please come again soon! "I stayed here with a few friends from graduate school and we very much enjoyed our stay. Even though we had some rain, we were able to enjoy the water from the great views from the house and the few quick steps to the beach. The views from the hot tub (covered!) and the whole house in general were perfect for our stay. Lots of room and all the amenities we needed. " Manager Response: So glad you enjoyed your time at Stairs to the Sea! Please come again soon! 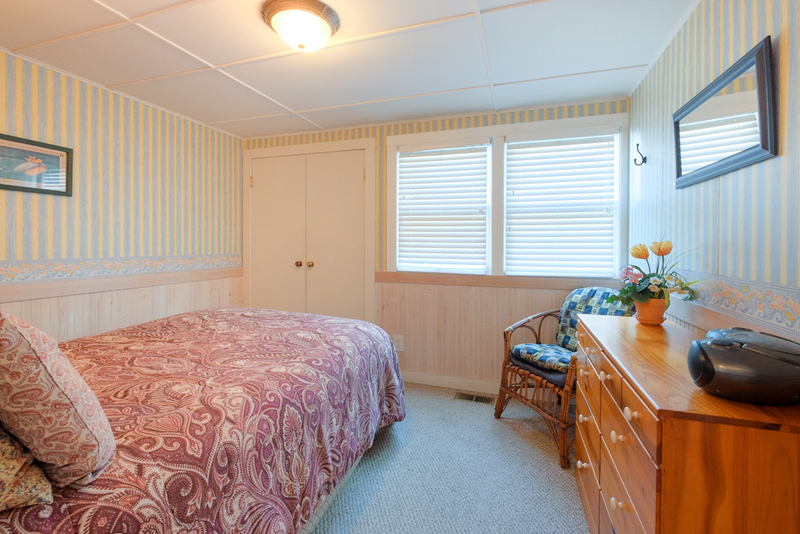 "The house was spacious and comfortable, perfect accommodations for our large group." Manager Response: So glad you enjoyed your stay! Please come visit again soon! "We found the house charming, lots of space, close to everything we wanted to do." Manager Response: Thanks for staying! Please come back! "the house is right on the beach. you can sit in the hot tub and watch the surf. fenced yard for toddlers. a few things that could be better. screens on the few windows that open. windows on the west side that open to let the sea breeze in. 3.dishwasher very small for large group. 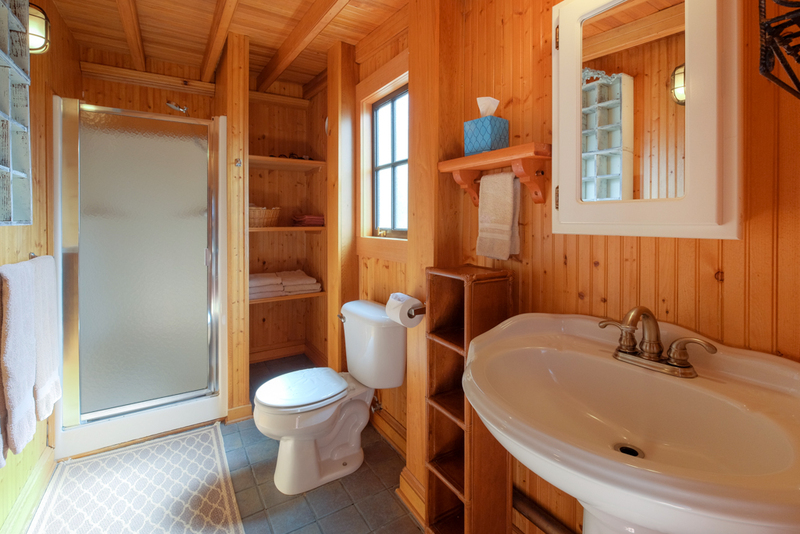 4.shower downstairs is challenging for because of small size. other than these few quirks, a great place to stay." "This is the 4th or 5th time we have stayed here during July and the experience has always been good. This year we really noticed the updates and remodeling...great job. " "this was our 13th year in a row we have visited Stairs to the Sea, always in September. As always the family retains great memories of the beach visit." 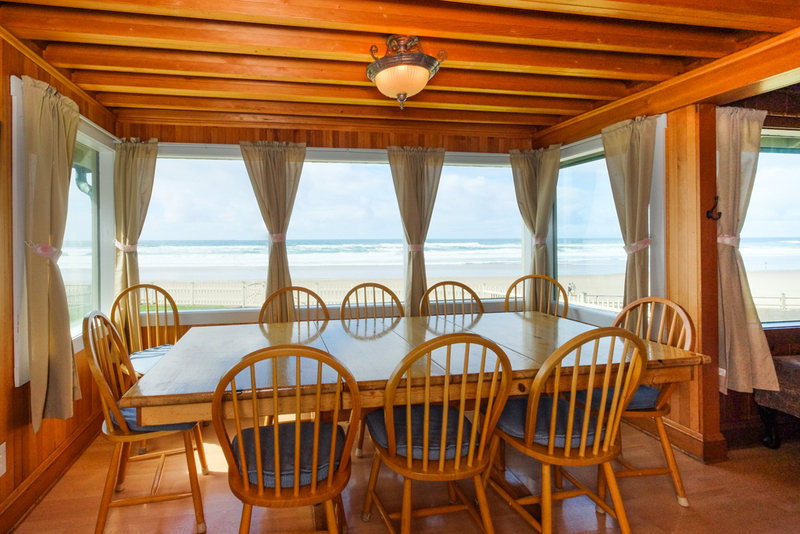 "We love everything about this feels like home.Ocean View's,easy private access to the beach,comfortable beds.Clean & lots of room.Our bunco group of 8 ladies stay every year at one of A-1's rentals. They are all good.But this is one of our favorites.A-1 is a great company they will take care of all your needs if at all get this home you have to book early thats how great this home is." Manager Response: Glad you stayed with us! Come again! "this house was perfect for our annual family vacation. The house looked very small from the pictures but it accomodated all of us comfortably. The beach access was a dream, the fenced yard great for the grandchildren and the hot tub was awesome. The only downfall was no bathtub, but the kids were bathed in the laundry sink. Very nice home to rent "
"The house was very clean nod comfortable. Beach access fantastic. Both showers are very small, but won't stop use from renting the home gain." "We had a wonderful time while staying at this rental. One cousin said she had the feeling of being on a cruise ship while sitting on the sofa because the view from the windows was that of nothing but water. We spent the evenings watching the sunsets from all those windows when it was a little cool outside. Beautiful! " "This house was perfect for our family of 10. 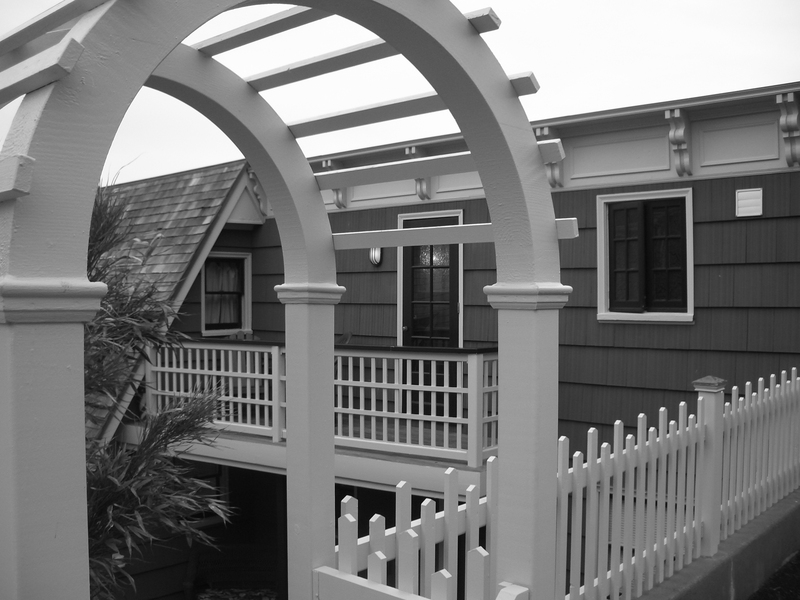 I loved the access to the beach, the front yard and the roomy parking for four cars. Except for the new washer and dryer, the appliances need to be updated, which would be my only complaint. Even though the house looks to be small it is very roomy inside. I would definitely rent this house again and would feel comfortable recommending it to other families with all age ranges." 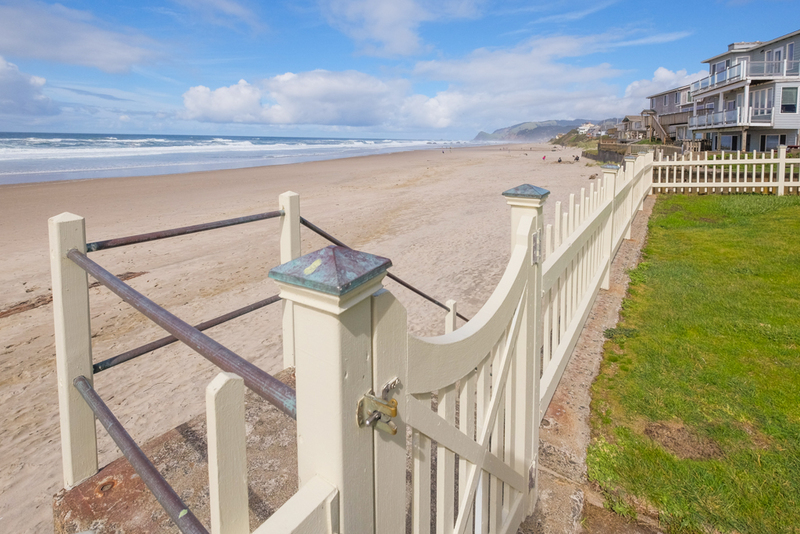 "We enjoys out stay so much that the family would like to start a tradition of going to Lincoln City and staying at "Stairs to the Sea" every year. The back yard was great for our toddlers. " "We loved this home for many reasons. Access to the beach & really only 7 steps down to the sand! 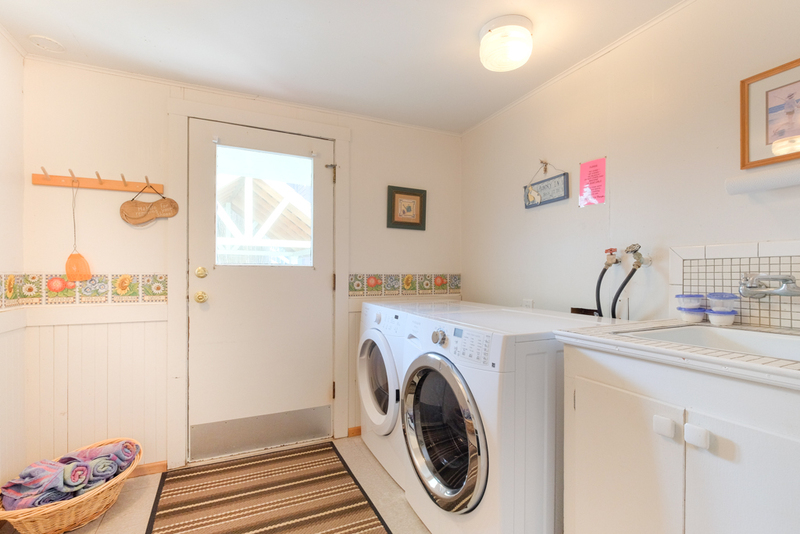 Hot tub very convenient with ocean view & covered patio. 5 Bedrooms was nice too! I don't know where to make commits but here is two: The dishwasher rubber on the right side is loose. There was no dishwashing soap, so we bought one & left it there - no biggie, but wanted you to know. Otherwise, we loved the place & want to reserve it again Nov. 2016." "The weather was awesome during our stay and being right on the beach was the icing on the cake. Finding an extra room was another plus so the kids could spread out. The only thing we did not like was being unable to open some of the windows to get the sea air. Very comfortable home. Thanks for sharing it with us"
Manager Response: Thanks for coming! Come back soon! "W had a sister reunion (4 sisters and one niece) here for 6 days, hadn't spent time together in 5 years. Found the property very quaint and homey, and the view to the ocean was worth a million $$$. On cool mornings we warmed up with the gas fireplace and lazily enjoyed our coffee while watching the beachcomers, kids and dogs strolling along the beach. WE have been to Lincoln City many times but enjoyed the close proximity to many daily outings (Tillamook, Pacific City, Newport, etc.) Two in our group had some mobility issues so the stairs were a bit challenging but overall everyone had a memorable vacation." "7 gals and one very ill husband had a wonderful stay. The view from kitchen and living room gave us all peace of mind - plenty of room for all of us to enjoy the views. Street level is up 15 or so stairs so was very difficult for husband. " "We absolutely loved staying at the "Stairs to the Sea" vacation home! We spent two days and two nights with a few of our children and grandchildren and we will cherish the memories forever! The home was the perfect size , the perfect location and clean and decorated so fun! " "We always have a great time at Stairs. You do need to try to improve lighting in the dining area." Manager Response: Thanks for visiting! Please come again! "We had an awesome time, right on the beach! We had fun walking on the beach and just watching everything going on. It is close to the Casino and the outlet malls. The house is old, but it was clean. It has multiple levels and a variety of sleeping options. Only negative work needs to be done in the upstairs bathroom, the shower head is broken. Has a great hot tub!" "The weather was good and we had a great time. There was an issue with the downstairs back bedroom. The window trim is not completely in track and so the room would get colder than comfortable. Loved the new cabinets. We had to purchase our own dish and dishwasher soap. We have not in the past. The sand toys by the hot tub were enjoyed by our grandchildren." Manager Response: Thanks for staying! Please come again! "Charming home, fantastic view, great location! Would definitely go back." Manager Response: So glad you enjoyed your stay! Come again soon! "What a perfect experience we had at Stairs to the Sea. Love the time spent there. Will always go back"
Manager Response: Thanks for staying! Please visit again soon! "We love this property but the bathrooms, especially downstairs needs updating. The faucet in the shower still leaks. This is the 3rd time we have rented this house over the last 10 years or so. Loved the appliances. The upstairs bedroom over the kitchen needs some help with cobweb control and a couple of the electrical outlets seemed to be flimsy..not working well. We appreciated the fast response when we asked for a toaster and got it in a quickly. Thank you. " "I already left a written review at the property when I checked out. " Manager Response: Thanks for staying! Hope to see you again soon! "This place was perfect for us. We were a group of three couples with three 1 year olds (and a 3 year old). The house has a beautiful view of the water, and has super quick access to the sand. The house came equipped with a baby gate and extra high chair, which made our lives much easier (we just trapped all the little kids downstairs with us). 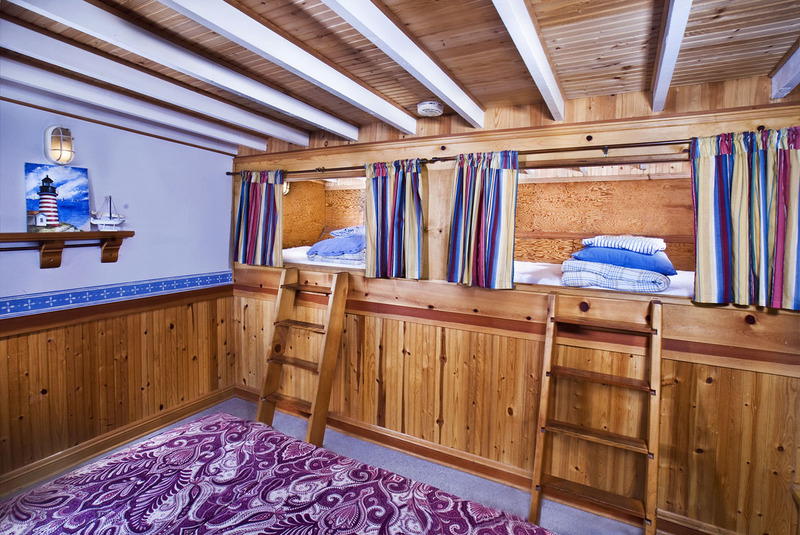 The house has alot of character, with a fun little bunk bed area that our 3 year old loved. Also easy walking distance to the main drag." Manager Response: Thanks for staying with us! Please come again! "The experience was great, as it always is. The boys ages are 12 to 22. All, but one of the cousins. I always have a good time at Stairs. The weather was wonderful, 10 days of sunshine. Boys use more towels than girls, with that many we could have used a few more towels, we just washed a lot. "Everything worked great, the house was clean, and we liked the short steps to the beach, not too many places offer that. The house is cute and cozy and we will be back !!" Manager Response: Thanks for staying! "We had a great time at stairs to the sea, weather was unbelievable all week and having the big yard and beach right there for our grandchildren was a huge plus. The only disappointment was the fireplace was not functioning but with such great weather we survived without it! Thank you for sharing your beautiful home with us :)"
"Everyone enjoyed our stay! You can't find a better view! So nice having our own access to beach. Kitchen was well equipped. Only complaint is first floor bedroom had a very uncomfortable double bed! " "On the beach, beautiful home very comfortable. Loved the hot tub." Manager Response: Thanks for coming! Please come again! "It was nice to relax with our kids and their family for the weekend"
Manager Response: Thanks for staying! Come back again! "Excellent area. Clean. Tripped a breaker and someone there with n a hour to fix. Great view. Easy access to beach. Hot tub very nice.. No negatives at all." "We had a great time in your house. The location was perfect. I would say that our only complaint was the lack of wine glasses in the cupboard. We bought a few from the dollar store and contributed them. :) We did not use the hot tub, but I'm sure it would have been great." "Our group of 7 girls from the Sisterhood have stayed in several VRBO houses over the years and seems "Stairs"is our favorite! The kitchen is always well stocked. Altho we found several dirty dishes in the cupboards this time. Stuff the dishwasher hadn't gotten off we guessed. And we could only find two wash cloths in the whole house but we made do with hand towels! We greatly enjoyed our visit again and will happily be booking another stay next year! " "What a huge blessing we received this last week. We had reserved the cozy little "Anchor" for a Honeymoon Hideaway. Upon getting on the road to drive down to Oregon...we received a call from Karen with A-1 Beach Rentals. She didn't want our stay to be interrupted or ruined in any way by some work that was being done in the rental next to us, so they moved us to the beautiful "Stairs to the Sea" ...it was so gorgeous and so peaceful...and we couldn't have asked for a more delightful place to stay on our Honeymoon." "Wonderful time at the beach. A little disappointed that the gas fireplace was not working because people were waiting for a part to arrive to replace something broken and we were not told in advance about this!" "As always our family vacation at the coast was amazing!! We have always and will always use A-1 Beach Rentals. " Manager Response: So glad you stayed with us again! Please come back again soon! "A very beautiful home right on the beach. There were 8 of us and we all had our own beds. The house was lovely but was short on dish soap and toilet paper, had to make a trip to the store for that. We could not figure out how to make the hot tub jets work but the hot water was very enjoyable. We also could not get the gas fireplace to work. Even with those things we are already planning another trip to this beautiful property." "I've spent Christmas at this property with my children and knew that it would be the perfect place to take all of my sisters and my nephew's family. The two kids LOVED their captain's beds and my sisters loved this house and how well stocked the kitchen was! Great experience!" Manager Response: So glad you enjoyed your stay! Please visit again soon! "Very nice place to stay! Very clean,pretty much everything that we needed was provided. "